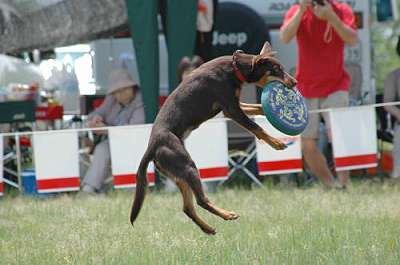 Sheena was sold to Japan to compete in Frisbee competition at a National level. This sport has a high profile in Japan. 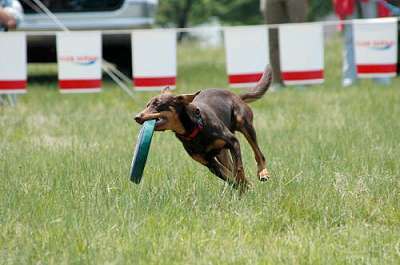 Her owner Shinji Yasuda already has a champion Frisbee dog. 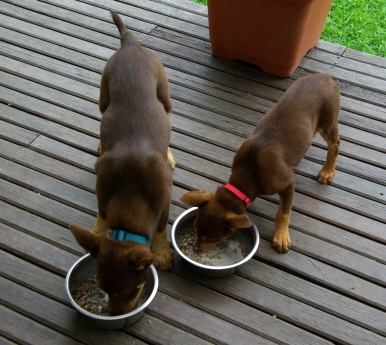 We made sure that he got a lovely, friendly puppy who was compliant, outgoing and good with people. Hi, Are you fine ? Yesterday I got a Stud Book Certificate from WKC . Thank you very much . 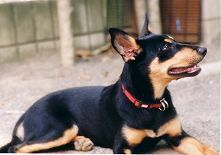 Sheena became ten month old , beautiful black & tan female . 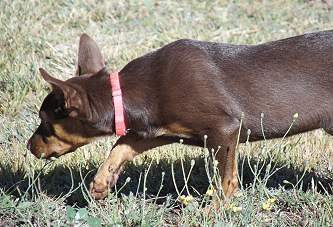 Her speed , stamina and concentration are wonderful . And very cute ! Now I enjoy to do basic obedience training with her . She likes to chase a Frisbee . Her speed of retrieving is amazing . But it is not yet complete. 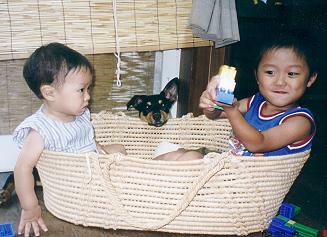 Noonbarra Sheena in Japan playing with her friend. 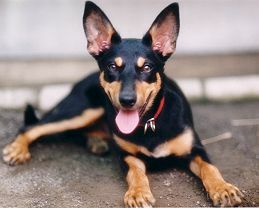 "Sheena is an attractive dog and happy . Yes I am competing with her . She shows wonderful run." 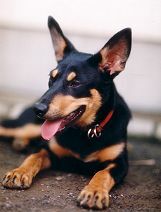 Noonbarra Saber is another Noonbarra Kelpie that has gone to Japan as a companion dog and to compete in Frisbee Competition which is high profile sport in that country. 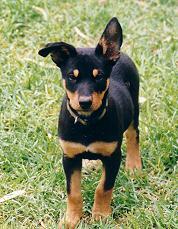 Hi Mary & Stephen, Saber arrived in good condition yesterday. He didn't seem the strain of traveling. I'm thankful to you for your job, and I grateful appreciate your kindness. Saber is good health . I think he is sensitive but not too excitable . 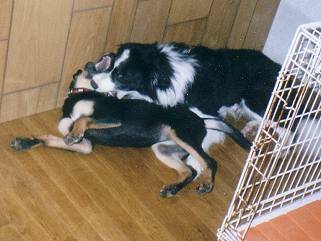 He is a gentle dog . I am very glad . 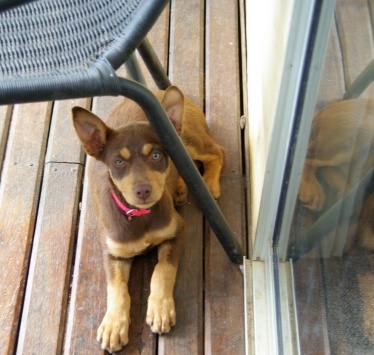 Hi Mary, What a gorgeous puppy she is!!! We became to love her so much! She arrived NO problem, although she was in mud poop. On the way to our house she didn't get motion sickness. Instead, she was very lively. It is amazing that how tough and healthy she might be. I have got the file and read some of the useful papers, thank you. Hi, Here are some photos of our precious puppy, Lady. It's been very cold but we didn't want to keep her inside. 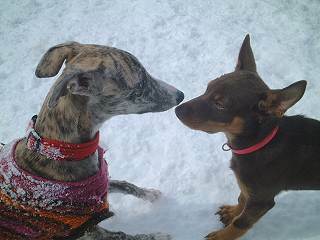 She made some friends already and looked very happy in snow. 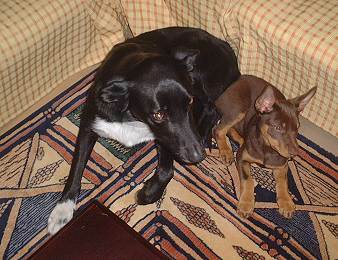 She is also settling down a bit and follows Manly, our dog everywhere. There is one thing that we can't make her do her business inside of the house. We want her to pee on the toilet sheet inside the house as well as outside because it is very convenient in Japan. But she doesn't seem to like it at all Have you taught her not to pee in the house? or even on the paper? Other than that, we have been doing great and are so happy having her here. Hi Mary and Stephen, It's getting hot and humid here in Japan .Lady will be 6 months old soon and weighs nearly 12kg now. 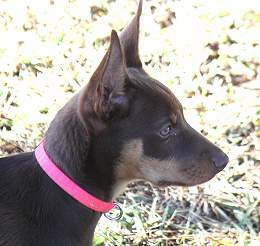 She is becoming a great companion dog and sport dog. 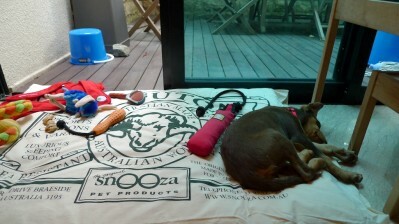 We often take her to various dog sports competition places and many people often ask us what breed she is. Last a few frisbee dog competition, Lady competed in retrieve category and won the third prize! She even caught the soft frisbee several times!!! I didn't really train her to catch it in the air but she naturally did it! Enjoy some photos of her top form. Mary and Stephen, It's been extremely hot and humid here in Japan. Lady has been doing pretty good in this weather and she now likes water very much. So we often take her to the beaches and rivers. She can swim pretty well! "Dear Mary and Stephen, It's been nice and calm weather here in Japan. Autumn is always nice to do lots of dog sports. Lady has grown beautifully and has been doing pretty well. She has visited old people's home a few times and gave them warm paw. 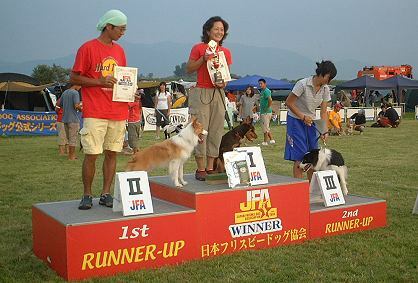 She has won the first prize at Frisbee competition in beginner level. And now we started doing a bit of agility. I found that Lady loves jumping and running very much and she enjoys it so much! One more thing we really would like her to do is sheep-dog-trial. There aren't many places that she can do it here in Japan. Actually, there is only a few farm with amusement park. I am not sure if we can let her do it unfortunately. I am positive that she will perform beautiful and we like to see it, you know. I will keep you up to date." Well little Yeti finally arrived and she is just gorgeous!!!! Such a little darling. She is having a rest in her crate, I put a nice little comforter in there and left it open for her to rest in when she wants to. We have started in earnest with the toilet training and so far we are 1-4 lol Once she settles over the next few days, I am sure it will get easier. Anyway, I'll be in touch again soon but just wanted to let you know that she was here and safe in our care. Yeti is going fantastically well. We went for our first proper walk today to the shops and she was a bit nervy on the way, lots of cars/trucks going past and being Singapore there are so many different smells around (which she found delightful), on the way home you would think she had walked it a million times as she was so confident, my son was on his scooter and they ran side by side. She is going great guns with the toilet training, not one poo inside at all and only a couple of little wee accidents the first 24 hours. I am just making sure I get her outside after she eats, sleeps, plays etc. and it all seems to be working well. Have attached two photos of her, she loves her pet futon and rolls around with her toys on there and is happy to sleep there in the open door. 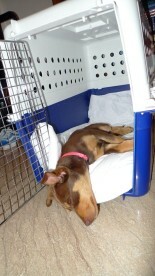 She absolutely loves her crate too, I leave it open all day and she just jumps in and has a rest when she wants. Her crate training is amazing, you guys did a great job.